Angel's Share: a poetic term symbolizing the portion of the brandy that evaporates during its long aging. Brandy (from the Dutch word brandwijn a liquor produced by distilling wine or other fermented fruits. Put simply, distillation is the process of boiling a liquid and collecting the vapors. In the Charentais distillation method, developed for Cognac in the Charent River valley of France, brandy is distilled twice in copper pot stills. Charentais Pot Still / Alambic: the type of pot still used in Cognac, and in making Osocalis brandies. Foreshots: the first low boiling compounds collected at the condenser. The foreshots may include methanol, acetone, and light aldehydes or esters. Heads: The heads are primarily ethanol, but also contain various flavored cogeners. Many of the floral and fruity components of the aroma are found in the heads. The cutting, or la coupe between the heads and body is carefully done by a master distiller, as this is one of the keys to a superior brandy. Blending: The traditional method of brandy elaboration combines the best features of eaux-de-vie from various grape varieties, harvest years, barrels, and aging details. The blending process takes years, as the component brandies marry in the cask. Boiler / chaudi�re / cucurbite: the part of the still that contains the wine or brouillis. The heat is applied to the copper boiler flask to boil the liquid producing the spirit vapors. Body / Heart / Couer: The heart is obtained during the Bonne Chauffe once the heads and the tails have been discarded, and it is the part of the distillate that will become brandy. The heart may be up to about 72% alcohol. Bonne Chouffe: Also known as "Second Distillation". The distillation of the so-called "brouillis" will produce the eau-de-vie. Brouillis: The distillate that is collected during the first distillation. It is typically about 30% alcohol by volume. Also known as "low wine". Cask / Barrel: The barrels used to store and age the brandy are produced from fine oak wood with the right grain structure. Everything from the growing climate of the tree, to the shaving of the staves, and the flame-toasting of the barrel contribute to the quality of the finished aged brandy. Typically brandy is aged in barrels of about 300-400 liters (~100 gal). Chouff du Vin: The wine preheater. This onion-shaped vessel sits high, between the pot and the condenser. As the hot vapors pass through the swan neck, they give up some of their heat to the wine in the Chouff du Vin, which will be used in the next distillation batch. Cooling Tank: The part of the still that contains the water that cools the condenser coil. Careful control of the temperature and flow rates condense the alcohol vapors smoothly. Condensor: the part of the still located after the swan neck and inside the cooling tank. In this tapered copper coil, the vapors are condensed to a liquid phase. Columbard, Ugni Blanc, Folle Blanche: The three grape varieties permitted for distillation in Cognac. Follignan is a cross between Ugni Blanc and Folle Blanche, that is also allowed. Cutting: the phase of the distilling procedure that separates the heads or tails from the heart. Distillate: The liquid that is collected from the condensation of vapors in the coil. Marc: The solid remains of the grapes or fruit after pressing for juice. Used in making grappa. Mistelle: Fresh grape juice with eau-de-vie added to prevent fermentation. Must: the liquid pressed from fresh grapes or fruit. The must ferments to make wine. Mutage: Adding alcohol to must in order to prevent fermentation. Used in making pommeax and mistelle. Pomace: The solid remains of the grapes or fruit after pressing for juice. Rancio: a term used to describe the complex aromas derived from long aging in oak casks. It may be detectable after 5-6 years, and more prominent after 10+ years of aging. Seconds / Seconde: the liquid that is collected in the distillation after the heart. 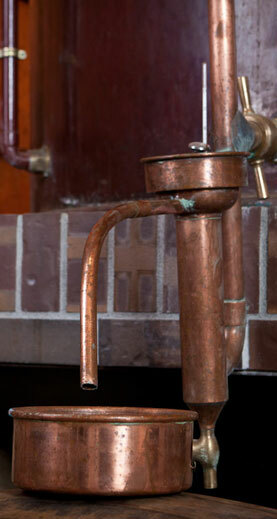 Swan's Neck: The curved portion of copper tube between the pot or boiler and the condenser. The swan neck is the top of the vapor path, where each droplet of vapor may continue downhill to the condenser, or downhill to return to the pot. Stave: the long, curved pieces of wood that are assembled to form a cask. Still: The device used for distillation, and employed in the making of brandy. The still consists of the boiler, the still-head and swan neck, and the cooling-tank and coil. The traditional Charentais still also includes a wine pre-heater. Still-head: the part of the still atop the boiler. Often shaped like an onion. Tails: The portion of distillate collected after the heart. Heavier and higher-boiling molecules are carried over by the vapors as the distillation runs to its endpoint. These can include more oily and astringent compounds that contribute to the complex flavors of a finished brandy. Tannin: Found in leaves, stems, and seeds of grapes, tannins protect wine from degradation by oxygen. Though tannins do not vaporize from the wine, tannins are also found in the oak wood of the casks, where they are slowly dissolved into the brandy. The distinctive tannins of different oak species and convey some of the uniqueness of woods from different forests and growth habits. Vinasse: The residue left in the still after the distillation. VS: Very Special, indicating that the youngest eau-de-vie in the blend has aged at least two years. XO: Extra Old. In the language of Cognac, the youngest eau-de-vie in the blend at least 6 years old.